Sgt. Rafael Peralta’s case for the Medal of Honor has shifted again, according to a congressman who has pressed the Pentagon to review new evidence that he says shows the Marine chose to smother a grenade to save his buddies in Iraq. 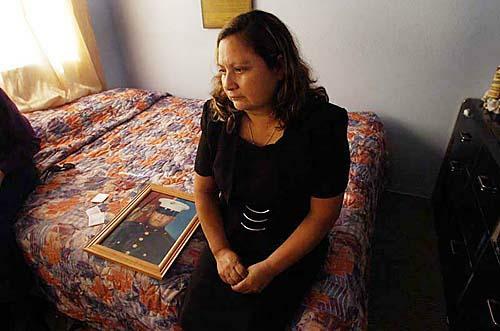 Peralta, 25, died Nov. 15, 2004, in Fallujah. He was awarded the Navy Cross in 2008 for disregarding his own personal safety while already mortally wounded, pulling the grenade to his body, “absorbing the brunt of the blast and shielding fellow Marines only feet away,” according to his award citation. Despite the extraordinary heroism, then-Defense Secretary Robert Gates shot down Peralta’s case for the Medal of Honor in 2008, leading the Navy Department to authorize the Navy Cross instead. Pentagon officials cited “contradictory evidence” on whether he had the cognitive ability to choose to cover the grenade despite already being mortally wounded in the head, outraging his family, fellow Marines and veterans. The Navy Department acknowledged in March that it was reviewing new evidence — two videos recorded shortly after the blast by fellow Marines and a new pathology report — but declined to characterize the move as a “re-opening” of the case. Rep. Duncan Hunter, R.-Calif., told Marine Corps Times on Thursday that Navy Secretary Ray Mabus said the Navy Department has now made a recommendation on what to do with that evidence to Defense Secretary Leon Panetta. Mabus didn’t share what the recommendation is, Hunter said. From the outside looking in, it’s hard to say what the shift back to SECDEF could mean. Based on prior valor cases, it seems likely the Navy Department would have squashed the case to re-open Peralta’s case for the MOH if they didn’t see grounds to do so, rather than passing the buck to the Defense Department. As a footnote, it’s worth noting that almost eight years of back-and-forth on this has been exceedingly difficult on the Peralta family. Still, Rafael’s little brother, Ricardo, now serves in the Marine Corps infantry. Pingback: Battle Rattle - A Marine Corps Times Blog – Marines ask: Why not more Presidential Unit Citations? Please give this Marine the honor he has earned. He brother Marines who were there have attested to his actions, and his sacrifice. I am a member of the GySgt Alan P. Loper Third Marine Division WI Chapter. I have made contact with the offices of Gov. Scott Walker, Congressman Paul Ryan, Sen. Ron Johnson and Sen. Kohl. I have made them aware of Sgt. Peralta’s ultimate sacrifice. I will not rest until he is given our nations’ Highest Honor. Next move will be petitions and correspondence with Washington, DC. I would encourage all to do the same in their great States. Marine Sgt Peralta gave to his country the Ultimate Sacrifice while bravely saving his brother Marines. Its time that we give to his legacy the ultimate honor. That being the US Medal of honor. Pingback: Battle Rattle - A Marine Corps Times Blog – Will next SECDEF decide fate of Sgt. Rafael Peralta's Medal of Honor? Pingback: Battle Rattle - A Marine Corps Times Blog – Will next SECDEF decide fate of Sgt. Rafael Peralta’s Medal of Honor? His brothers and fellow Marines with him testified to Sgt. Peralta’s actions. For those of us who wore the Uniform Of US Marines we take our honour to the grave. We live our life with it as well. Give Sgt. Peralta and his surviving family the same respect and love he no doubt held for those he gave all for! the virus can no longer multiply. The Start Of Chicken Pox Cure | Treatmentofchickenpox. Info Pictures 2013. Indian curries use large quantities of onions.